I've mentioned briefly some of the trouble that I've been having with Michael and sleeping. I've honestly tried not to focus on it too much, because while I know that not every post can be amusing, or "full of sunshine and roses," I do want to make an effort to focus more on the positive than the negative. After all, there is so much positive to be found. But I would be lying if I said that the situation was no big deal, or even that I can push through it all because I know that this time in his life won't last forever. Because I truly don't think that I can for much longer. Today was one of those days where my ability to cope just ground to a sudden halt, and I had to depend on Tom to step in and take over where I could not. It's times like this that I know with certainty that God is watching out for me and for my family, because if this had happened a year ago, Tom would have been in a more traditional work situation, and would not have been around to help. But around this time last year, he switched jobs, and has been working from home ever since. This was an incredible godsend during my pregnancy with Michael, especially towards the end, when my capabilities were drastically inhibited by terrible back pain and constant contractions. He completely took over the physical aspects of Abby's care, as I could no longer lift or carry her. It continues to be an incredible blessing now, for though the lion's share of the children's care is left to me between the hours of 9 and 5 on weekdays, he's still physically present in a pinch, and often available to step in for extended periods of time. Like today- when the kids went down for naps within 15 minutes of each other, and driven by a burst of adrenaline from the excitement of this achievement, I gave myself about 20 minutes to play around on the PC, and then grabbed a huge pile of laundry that's been sitting in the dryer for days, waiting to be folded and put away. It was like I jinxed myself. Almost immediately, I began to hear Michael wailing over the monitor. If he stays down for at least an hour, I will often leave it at that and bring him back out to start the Eat, Activity, Sleep cycle all over again. But he was only down for 30 minutes, and he skimped out on his nap this morning, too. So, suddenly feeling exhausted, I brought him into bed with me, to nurse him side-lying. Well, he wasn't having that. I sat up instead, and let him suckle himself to sleep. The urge to just hold him that way was overwhelming, but his already terrible sleep habits have taken a turn for the worse lately, and I'm convinced that it's because I keep giving in and letting him sleep in my arms during the day- he's starting to hold out for the same treatment at night, and is at times nearly impossible to put back down after a waking. So I laid him in the bassinet, and struggled to calm him for about 10 minutes. When the massaging, back rubbing, patting, repositioning, and constant re-insertion of the binky yielded no results, I picked him back up to try again. Within 15 minutes, I faced the same dilemma as earlier, only I was more exhausted at that point. So, when Tom came in to check on us, I asked him to try putting Michael down. He was no more successful than I was. And my stress and frustration grew as I watched him try. I sort of lost it, then. I just went limp. I began to cry and insist to Tom that I just couldn't do it anymore. And in that moment, I really could not. I could not do anything other than lie in my bed, feeling utterly defeated. But Tom had my back, and he spoke words of encouragement as he swept little Michael up in his arms, and left me to rest. He gave me at least two hours, which I spent in fretful half-sleep, but it was something. And it was just enough. I came out of the bedroom feeling more tired than ever- tired to my bones, but infinitely more functional than before. 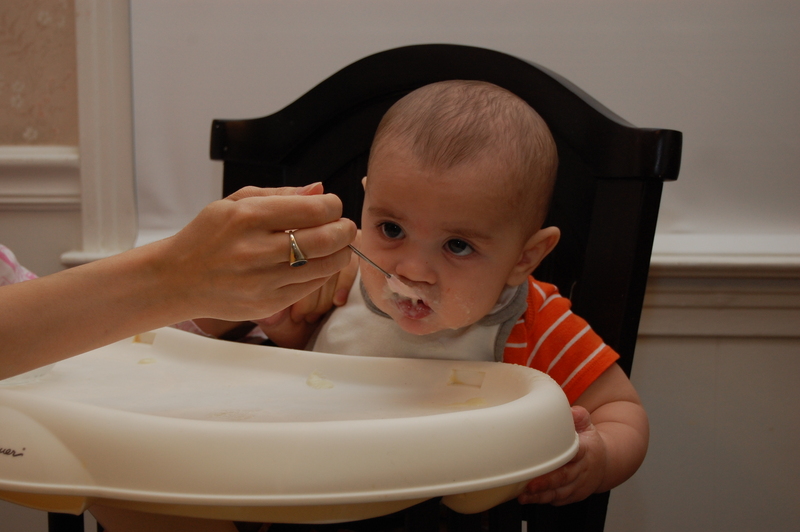 And we discussed again the thing we'd been discussing for the last few days: whether to try what I consider an extreme measure and experiment with solid food a few weeks ahead of schedule. I finally decided to go for it. I'm a big believer in following the six-month guidelines, but it's down to trying this, or trying some cry-it-out (CIO) method of sleep training, and I just can't do the latter. I did try a bit of CIO with Abby, but not until she was much older than Michael is now, and I never felt very comfortable with it. And Michael is such a different personality, too. I never felt the sense of urgency from her in her need for me, all the time, the way I do with him. I really feel that it would do him some amount of harm. Given his terrible tummy issues from the start, I fear that this may do him some harm as well, but I feel as though I'm stuck between a rock and a hard place, because if I can't restore some level of functionality to myself, I won't be able to dedicate the amount of energy, love, and affection to my children that they both deserve, and need most of all. 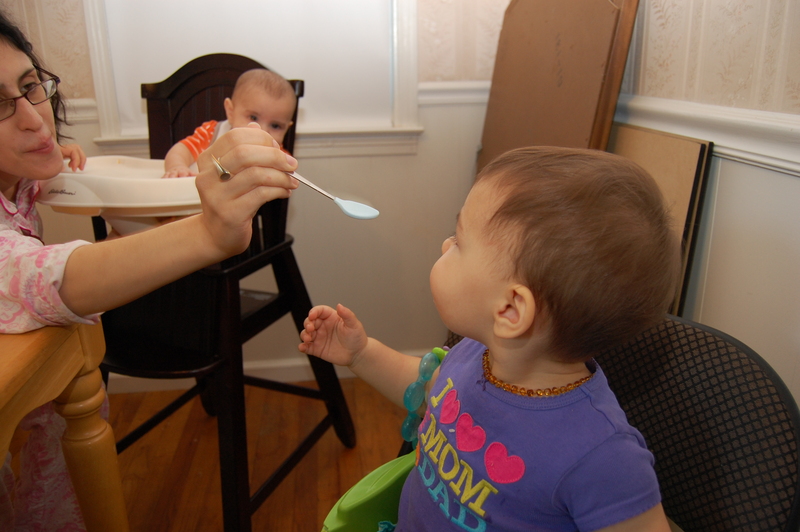 Tonight was the night, and we started with about 1.5 tablespoons of rice cereal. I was very impressed with how well he did initially, but after the first few bites, he did prove to still have a bit of residual tongue-thrust reflex, which filled me with doubt all over again, and made for a bit of mess. He did, however, seem to really enjoy it, and that fills me with a hope that I'm a little afraid to even let myself feel. After all, even if he does okay with it digestion-wise, there's no guarantee that it will help him sleep longer. I'm not even sure how much his frequent wakings have to do with hunger to begin with. But what's done is done, and now we wait. And, as always, we got some pictures out of it all (Tom was my photographer for all but the last one). 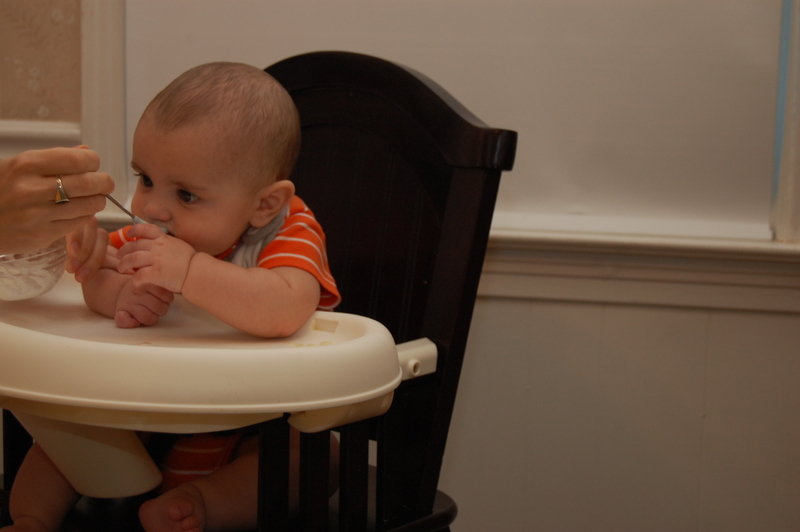 He seems to think that high chair trays are good for cleansing the palate. After awhile, Abby decided that she wanted a bite. Don't mind my utter unkemptness. Can you see how exhausted I am? She liked it! Here she is, asking for more. 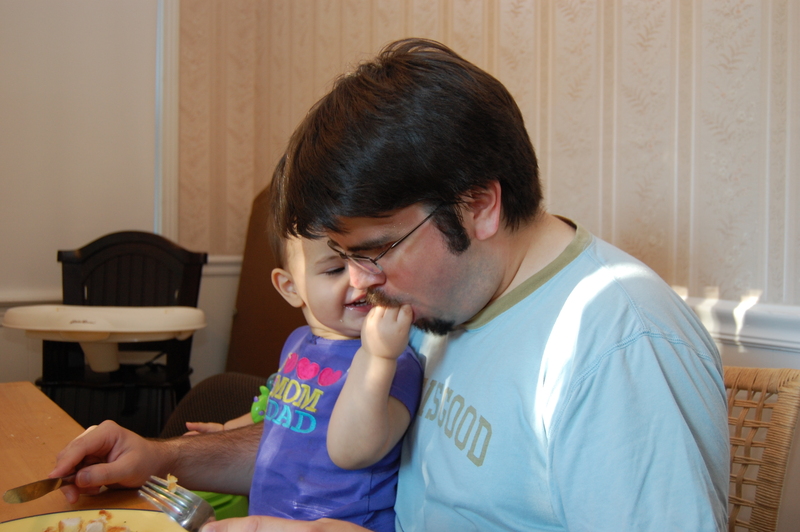 And that she wanted to feed Daddy.